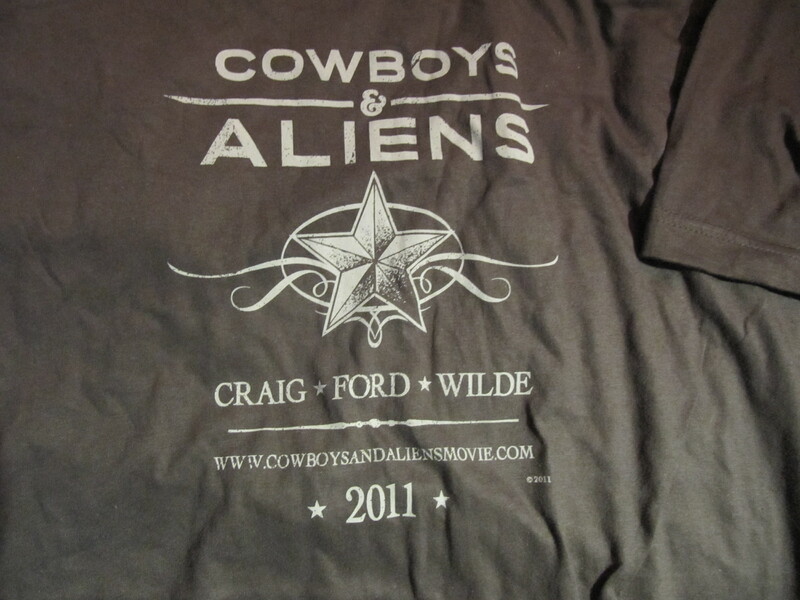 I went to the premiere of Cowboys and Aliens Tonight/Thursday July 28, 2011, Daniel Craig was fun to watch, it had some real exciting action, a bit of humor and comp Shirts that I would buy in the store. Grey and slate grey thin materialised shirts are my favorite. This one even has the distressed lettering. Pretty hip cool shirt for a movie premiere giveaway. It even has the infamous nautical star that many people are getting tattooed over the last 5 years. The only thing missing is something to do with Aliens. The star shows the feeling of Cowboys, but I think it would have been Hot if they snuck the Alien in the background of the Star. Although-fashionably over all an awesome shirt that I will wear this Summer and beyond. If you see the movie let me know what you think? I think the critics can go many different ways on it. Have a Great Weekend! !